As you prepare for the holidays, we are happy to unveil some improvements to our VPN service. Please read on to see what’s new! Back in September 2016, we introduced the free, built-in, browser VPN service, which doesn’t require the users to log in, nor does it store any log data from their surfing history. 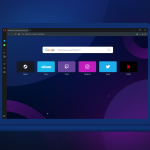 This made Opera the only major browser with such a unique service. Guess what, we’re still the only one! 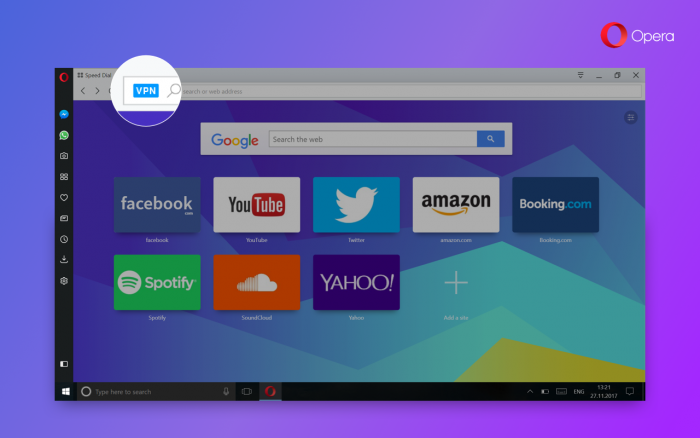 Now, we are introducing our first major upgrade to the browser VPN service, which will be rolled out gradually across the globe as an update to Opera 49. In the past, the VPN service was hosted and operated by SurfEasy LLC, a company recently acquired by Symantec. We have looked into the best options for hosting the service and came to the conclusion that the browser VPN service should be moved to our own data centers. This is becoming reality now and we’re excited about this change. Here’s why: as you probably know, Opera has vast experience with hosting big server infrastructures. This means the co-location of the browser VPN service to our data centers is expected to result in increased performance, scalability and balancing capabilities, while allowing us to keep it a free and no-log service. Furthermore, we are confident that the improved VPN service will be of higher quality and performance. 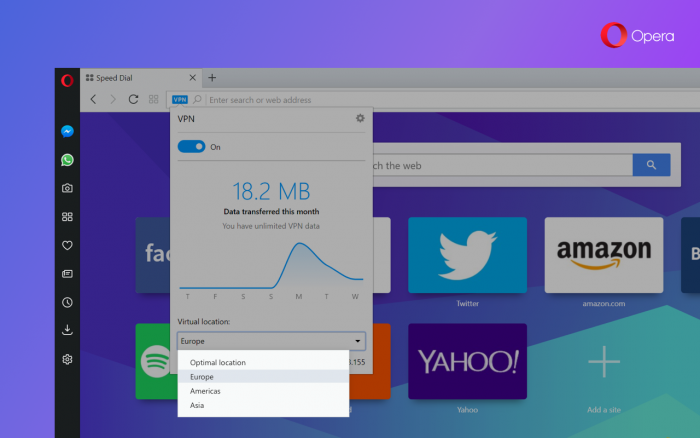 This update to VPN was first introduced to our developer version on November 30 and we are now rolling it out in the stable version of Opera 49. As we move the service to the Opera data centers, we are also changing from listing locations based on countries to regions. For the updated browser VPN, we will provide these options: optimal location (default), the Americas, Europe and Asia. Locations will be rolled out gradually, starting with Europe today and the Americas and Asia coming soon.